As demonstrated at Enterprise Connect 2017, Tap to Speak innovating with communications APIs. If you've ever had the chance to present to a large group, you know the difficulty of engaging audience members and keeping their attention. Even the best presenter has significant competition from the ever-present mobile device, and sometimes no amount of coaxing will get attendees to "step up to the microphone" and ask questions in front of the crowd. Here's a look at how WebRTC and communications APIs can solve the problem of audience engagement. 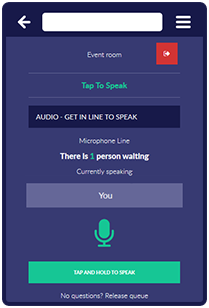 I came across this innovative audience engagement application, Tap to Speak, last month during a WebRTC session at Enterprise Connect 2017 (see related No Jitter post). There I met Marek Wawrzyniak, CEO and co-founder of the application software development firm that created Tap to Speak. Subsequently Marek was kind enough to join me for an episode of my Communications Developer Zone podcast, sharing the story of his Tap to Speak journey. Marek's story starts in an Indiana seminary school, where he honed his skills in public speaking and started his software development craft. Soon after seminary school, a local company hired him to do some programming in COBOL before he got involved in Web development and applications. Along the way, Marek noticed a need to enhance audience engagement during public forums and to make posing questions and driving the conversation easier for participants. He saw this as an opportunity for a new application. "Why not turn the smartphone microphone into a microphone that people can use to ask questions?" he asked himself. The challenge was voice-enabling an application, and integrating that application with a Web portal through which the presenter could allow questions via voice and instant messaging. WebRTC offered a potentially perfect solution, allowing one-way audio with a pure Web application, Marek said. He and his development team started with an open source WebRTC library and quickly produced a working demonstration. "My developers put together an initial demo in two weeks," he said. With the demo, Marek said he was able to start marketing his application to companies -- to great positive interest (including from Disney). But the open source software came with some problems that caused reliability and peer-to-peer connectivity issues in some venues. "Those of you that develop with WebRTC know how difficult it can be!" he said. One of the challenges Tap to Speak had at this stage was in establishing a peer-to-peer media stream from a participant's smartphone to the presenter's laptop with minimal latency. "Some of the conference rooms block the connections, preventing peer-to-peer connections within their networks," noted Marek, referring to a common a security technique. Tap to Speak needed to be able to detect when a venue was blocking peer-to-peer connections and instead engage an external TURN server to pass the media stream from the smartphone to the presenter. Marek and his developers partnered with Temasys for a second round of development, and have done a total redesign based on that company's WebRTC development platform. Fortunately for Marek, the Temasys platform automatically manages media streaming and provides TURN services, solving his connectivity issues. As demonstrated during the Enterprise Connect session, "WebRTC Stories From the Field: Innovative Applications," Marek was able to establish real-time voice connections between the two session moderators, showing how users can submit voice questions in large venues, even when the WiFi is suspect. But Marek isn't done yet. He's working on a couple dozen new features, he said, and continuing to sell the Tap to Speak platform in the U.S. and Europe. As the story comes to a close, despite some initial challenges, WebRTC and Temasys turned out to be core technologies that made his application possible. At your next conference or town hall event you may be lucky enough to see WebRTC and Tap to Speak in action, hopefully keeping you and the rest of the audience engaged.